The Container Store on Tuesday reported consolidated net sales fell 0.6% to $221.6 million in the third quarter. Net sales in the company's retail business rose 0.5% to $204.9 million, and third-party net sales took a hit, falling 12.6% to $16.7 million, which the company attributed to "foreign currency translation." Same-store sales fell 0.8%. The company said holiday departments' sales sunk 15.8%, contributing to a 3% decline, but sales from Custom Closets jumped 4.5%, contributing to a 1.8% increase, according to a company press release. The Container Store also released partial-quarter numbers for Q4, noting that comp store sales in January rose 9.4%. Consolidated net income was $9.3 million in Q3, down from $28.4 million in the year-ago period. Adjusted EBITDA was $21.8 million, down from $25.6 million a year ago. The Container Store missed Wall Street's expectations in its third quarter earnings due largely in part to less-than-stellar sales in its three holiday departments, which also underperformed last year. "[O]ur three holiday departments, which represent a disproportionate amount of our sales in this quarter, but only a small portion of our annual sales, underperformed resulting in our comparable store sales decline for the third quarter," CEO Melissa Reiff said in a statement. However, Reiff said the company has shifted its focus to its custom closet business, which helped make up for lost sales in the holiday departments this quarter. "In light of the success we continue to see around Custom Closets and the learnings from our Dallas flagship store redesign, we are planning to remodel two existing stores this summer with more focus and space allocated to Custom Closets and related solutions to help our customers accomplish their projects," she added. 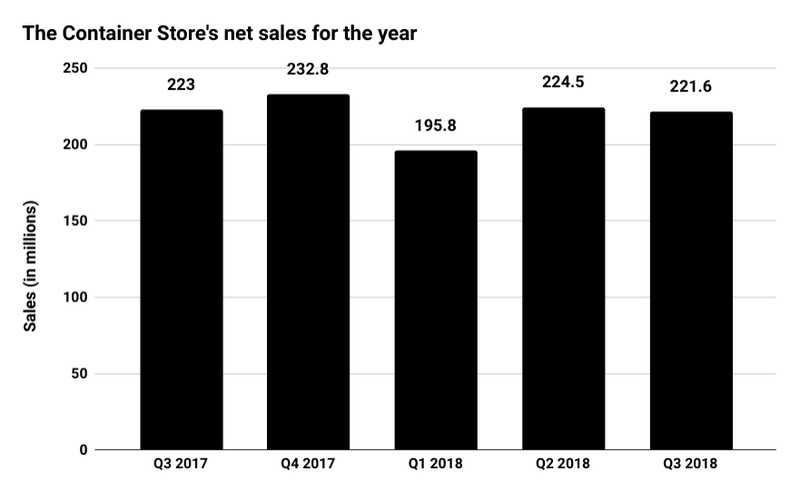 To reflect its underwhelming performance in the year-to-date period, The Container store has lowered its fiscal 2018 outlook from $885 million to 895 million to the "lower end of $885 million to $895 million." The news comes almost two weeks after Co-founder Kip Tindell and his wife, Sharon, announced their departures from the company beginning in August. Kip, who served as chairman of the board, will be succeeded by Reiff, and Sharon, who served as president and chief merchandising officer, will be succeeded by Executive Vice President of Merchandising and Planning John Gehre.